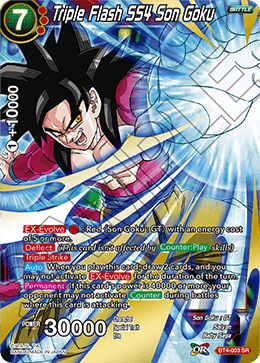 : Red ＜Son Goku : GT＞ with an energy cost of 5 or more. When you play this card, draw 2 cards, and you may not activate for the duration of the turn. 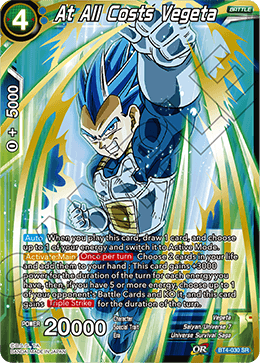 If this card's power is 40000 or more, your opponent may not activate during battles where this card is attacking. 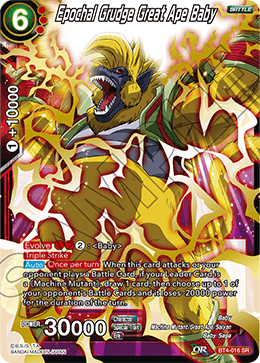 When this card attacks or your opponent plays a Battle Card, if your Leader Card is a 《Machine Mutant》, draw 1 card, then choose up to 1 of your opponent's Battle Cards and it loses -20000 power for the duration of the turn. 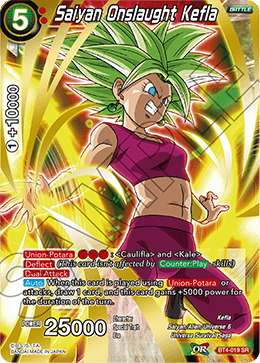 When this card is played using or attacks, draw 1 card, and this card gains +5000 power for the duration of the turn. When you play this card, draw 1 card, and choose up to 1 of your energy and switch it to Active Mode. 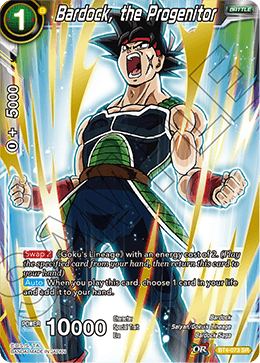 Choose 2 cards in your life and add them to your hand : This card gains +3000 power for the duration of the turn for each energy you have, then, if you have 5 or more energy, choose up to 1 of your opponent's Battle Cards and KO it, and this card gains for the duration of the turn. 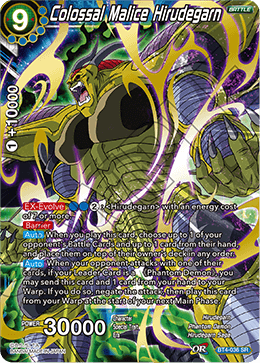 : ＜Hirudegarn＞ with an energy cost of 7 or more. 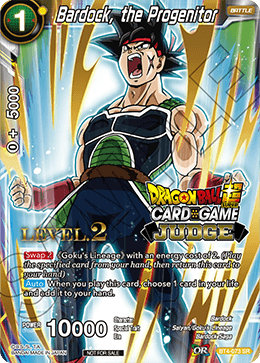 When you play this card, choose up to 1 of your opponent's Battle Cards and up to 1 card from their hand, and place them on top of their owner's deck in any order. 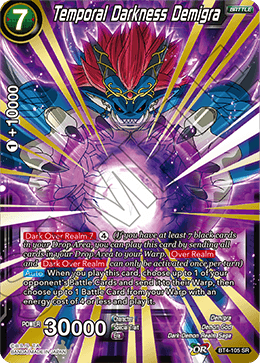 When your opponent attacks with one of their cards, if your Leader Card is a　《Phantom Demon》, you may send this card and 1 card from your hand to your Warp. If you do so, negate the attack, then play this card from your Warp at the start of your next Main Phase. 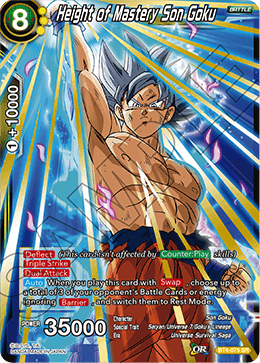 (This skill takes effect when you have 2 or more Battle Cards in play) Choose up to 1 of your opponent's Battle Cards and KO it. , place 1 card from your hand into your Drop Area : ＜Lord Slug＞with an energy cost of 4 or more. 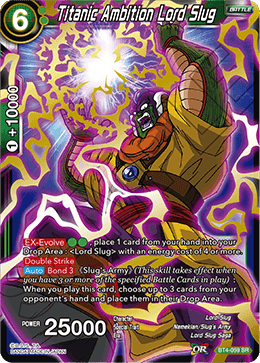 《Slug's Army》 (This skill takes effect when you have 3 or more of the specified Battle Cards in play) : When you play this card, choose up to 3 cards from your opponent's hand and place them in their Drop Area. When your opponent combos, they choose 1 card in their hand and place it in their Drop Area. When you play this card, choose 1 card in your life and add it to your hand. When you play this card with , choose up to a total of 3 of your opponent's Battle Cards or energy ignoring , and switch them to Rest Mode. 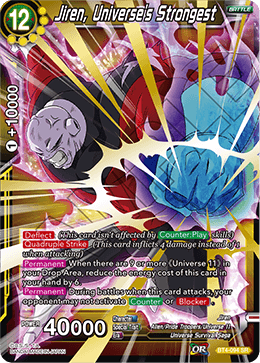 When there are 9 or more 《Universe 11》 in your Drop Area, reduce the energy cost of this card in your hand by 6. 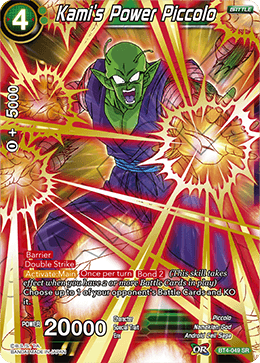 During battles when this card attacks, your opponent may not activate or . 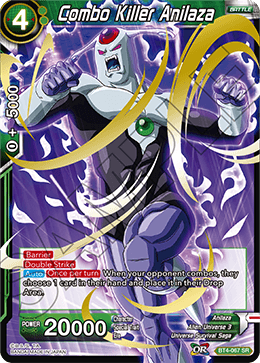 When a card evolves into this card, draw 1 card, then choose up to 1 of your energy and switch it to Active Mode, then choose up to 1 of your opponent's Battle Cards and send it to their Warp. 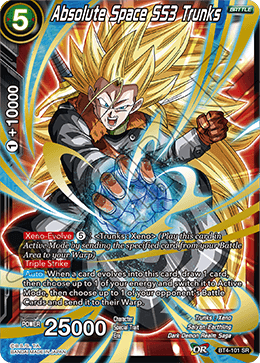 When you play this card, choose up to 1 of your opponent's Battle Cards and send it to their Warp, then choose up to 1 Battle Card from your Warp with an energy cost of 4 or less and play it. 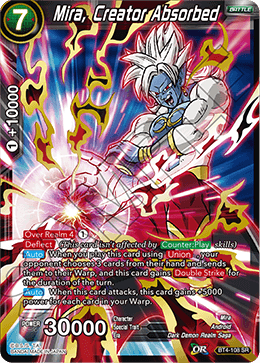 When you play this card using , your opponent chooses 3 cards from their hand and sends them to their Warp, and this card gains for the duration of the turn. When this card attacks, this card gains +5000 power for each card in your Warp.